When we started the kitchen renovation, I knew we'd need to reuse as much as possible and modify it in a way that fit our budget. One detail I noticed in a lot of new kitchen designs is the cabinets go all the way to the ceiling. Ours had an empty space above the cabinets, about 11", which is too small to add in an extra cabinet since the shortest standard ones are 12". 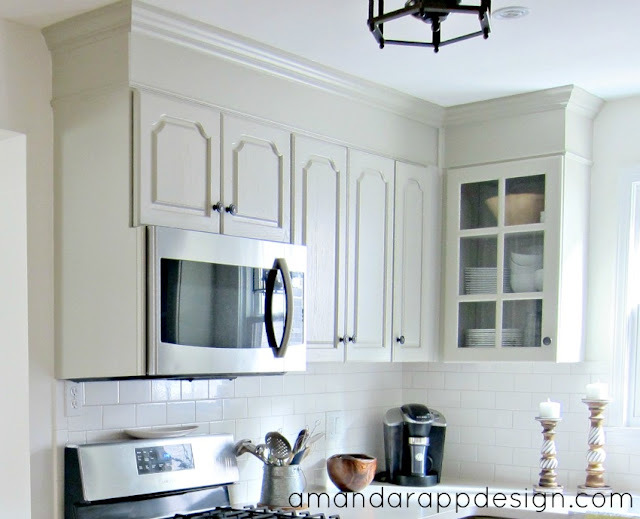 I still wanted the look of the extra tall cabinets so we ended up boxing in the empty space and adding crown molding to give us the same effect. It is worth noting that this project would be considerably more difficult if I was planning on keeping the wood tone and trying to stain the extra height pieces to match. 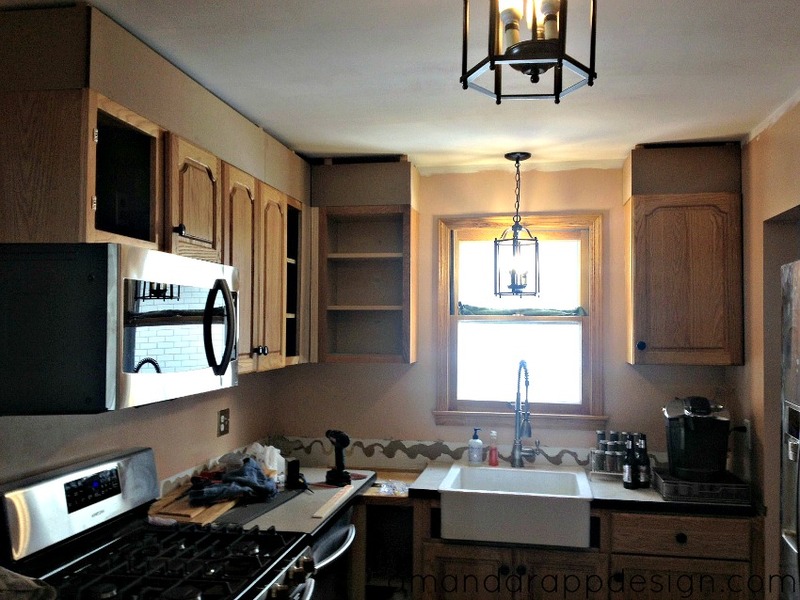 I knew before starting this renovation, the only way we could make it work was to paint it all once the changes/additions had been completed. Please forgive me for two things: One. 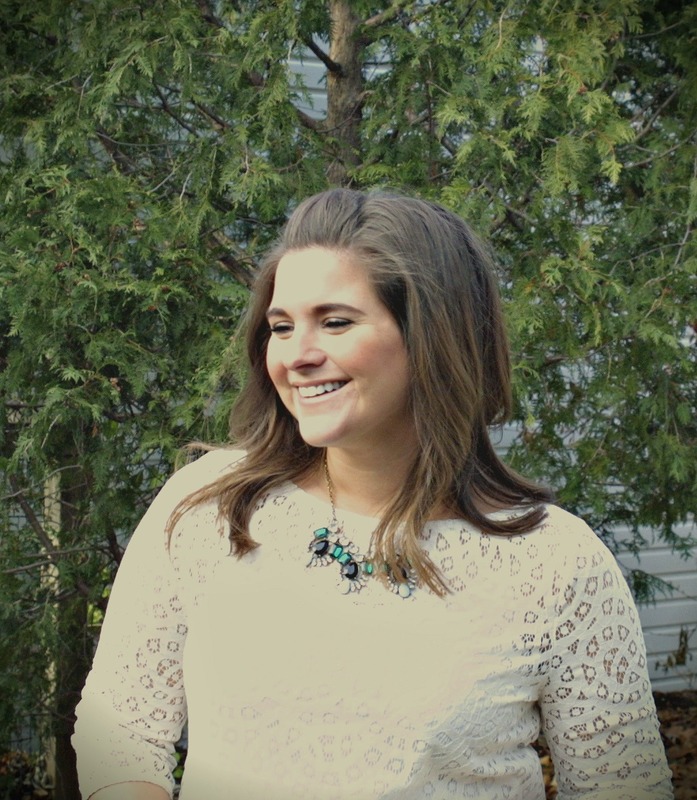 the photo quality on all of these images is just terrible and Two. all the clutter/mess everywhere. 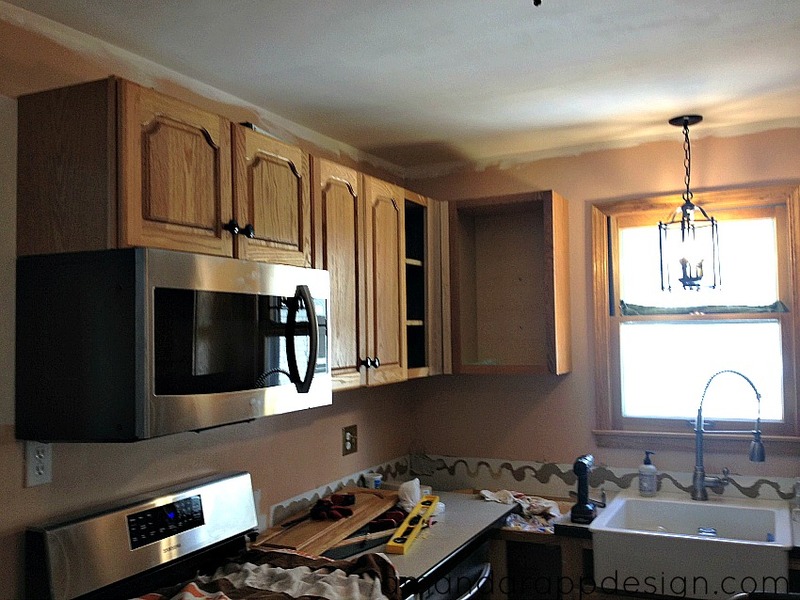 Have you ever lived through a 3-month long renovation??.. it really can't be avoided. Ok.. enough excuses. 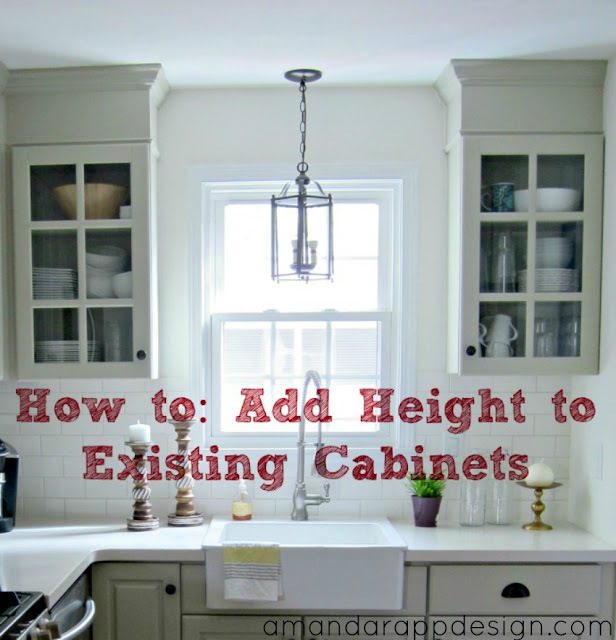 Before we could add the height extenders, we needed to re-arrange the upper cabinets - move over the microwave and add in the new cabinets above the sink. 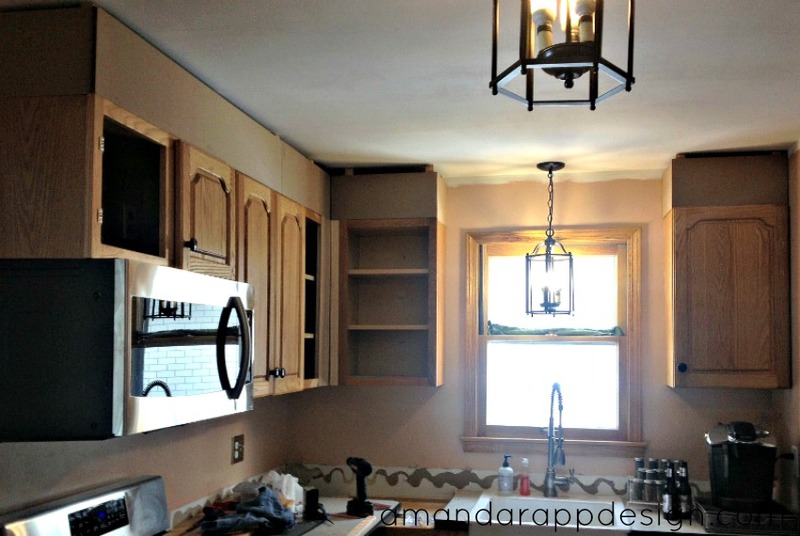 And because we get distracted easily, we also installed the new sink and lantern pendant. First, we attached 1x2 wood pieces vertically inside the ledge on the top of the cabinet to create a support frame. 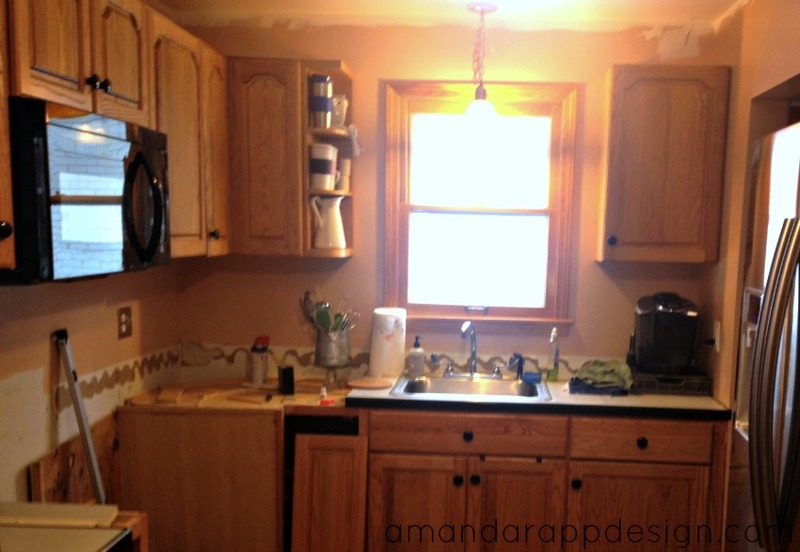 You can see them sticking out a little on the cabinet to the left above the sink. Then we added MDF boards to box in that empty space. 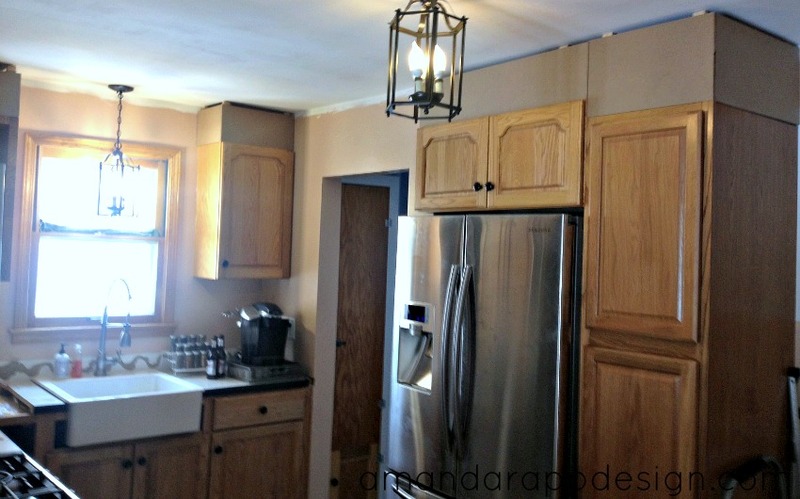 We also moved out the cabinet above the fridge so it would be flush with the new tall pantry cabinet next to it. 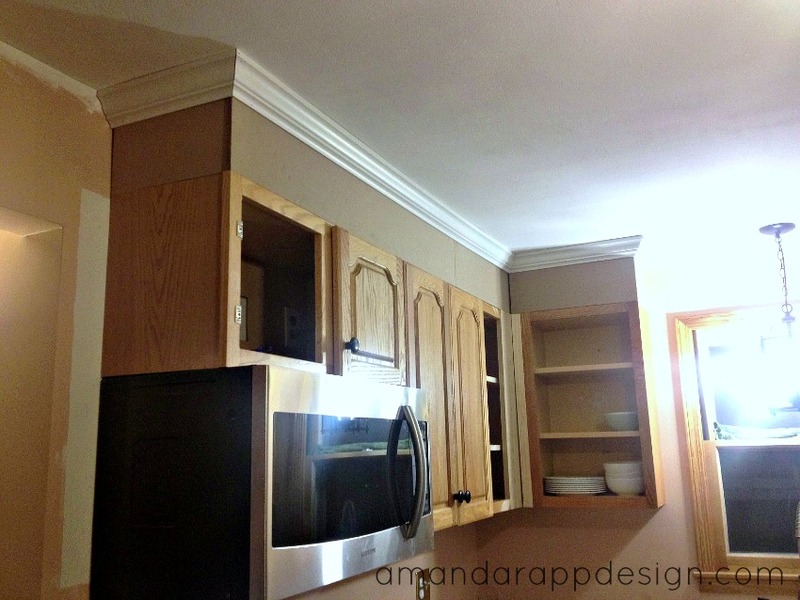 We added crown molding to cover the gap and for some extra details to the cabinets. Next we needed to cover the seam between the top of the cabinets and the extra height boxes - we used a thin piece of molding for this. We also filled the seams between any of the boxes so it would be a smooth front and caulking any gaps. The next step was priming and painting the cabinets, height extenders and crown molding all to match. Apparently, I forgot to take pictures of those steps. I am SO happy that we made the choice to box in the empty space.. it really draws your eye up and makes the room feel so much taller. 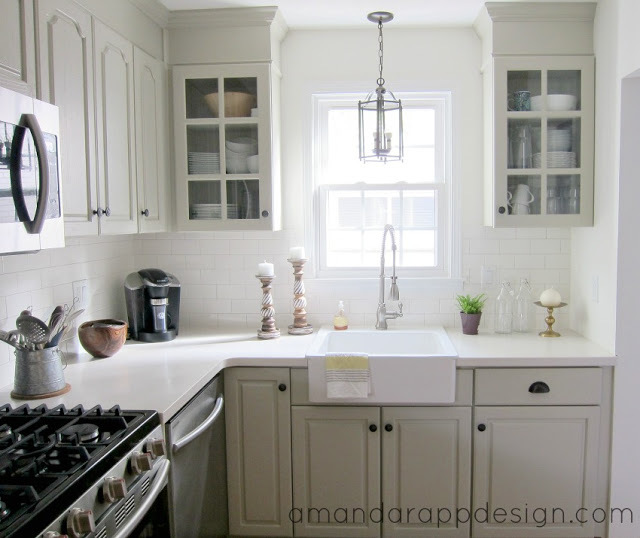 For more pictures and details of the finished kitchen, check out this post. Please let me know if you have any questions! Hi! Thank you! 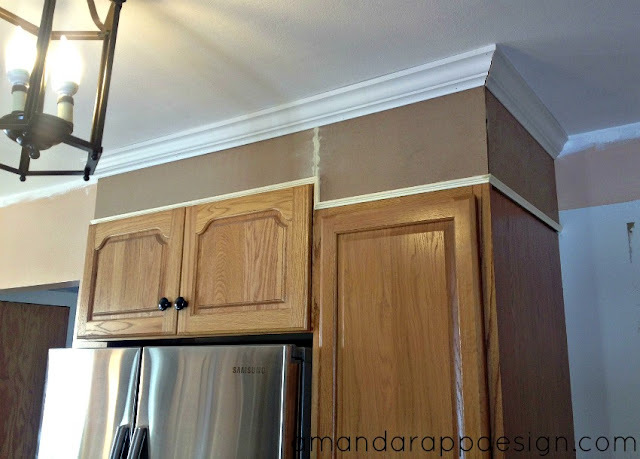 So our cabinets had a lip around the top which we were able to screw the 1x2 supports into. They were pretty sturdy so we didn’t attach to the ceiling. Hope that helps!